Sometimes, a movie that plays to the masses in an unashamed and unadulterated away is just what you need for awards season viability. 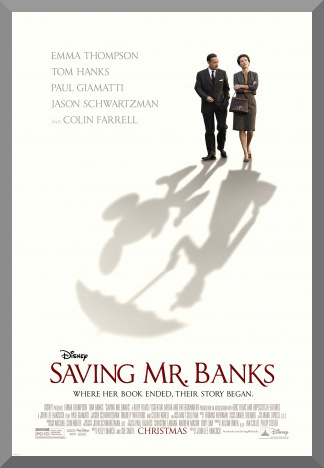 Saving Mr. Banks is a bit too emotional at times, but it’s quite credible in how it works for the rest of its 125 minute runtime, complete with stunningly good acting and a touching story that admittedly could have done a little bit better with reflecting the facts. 1906: The girl who would become Pamela (P.L.) Travers is played by Annie Rose Buckley, who moves with her family to a new house, complete with a cow and chickens. The patriarch (Colin Farrell) loves his family, but is in jeopardy with his job at a bank due to his alcoholism. The struggles that ensue because of her father play a large part in shaping the young girl’s life, and eventually the book (and its sequels) that she will one day write, Mary Poppins. 1961: P.L. Travers, now played by Emma Thompson, has time and time again denied Walt Disney Pictures the film rights to Mary Poppins. She is afraid of what will happen (“He’ll make her [Mary] sparkle…”), but eventually agrees to visit Los Angeles and allow the production to go forward under the condition that she’ll have script approval. We learn that Mrs. Travers (that is the only way to properly address her, she says) is, to put it nicely, defensive about her writing. To put it honestly, she exudes a stubbornness that is of an astronomical extent. She’ll reject any idea that is thrown about, and it is up to Walt Disney (Tom Hanks) to convince her to sign over the rights. So maybe it is a bit worthy of suspicion that a movie that essentially praises the existence of a Disney film would be so shamelessly distributed by The Walt Disney Company. So maybe the film is a bit long. So maybe the ending of the film reflects a sunnier disposition that occurred in real life. Never mind that. This is still a quite marvelous picture. Kelly Marcel and Sue Smith’s screenplay, an inhabitant of the 2011 Black List, should be commended for skillfully splitting between the two periods of time it depicts, although perhaps the 1906 segments do not carry the same overall flow from a storytelling perspective as the 1961 segments. The acting is top notch, as one would expect from such a high caliber cast. Thompson is extraordinary as P.L. Travers (born Helen Goff). During the initial production meetings, she ensures that there is never a moment where we cannot understand where the character is coming from in her comments, even if we are left to gape in disbelief in many of the demands themselves. Hanks, playing Walt Disney himself, had the benefit of hours of television footage to base his performance on. A largely underdiscussed performance here is Colin Farrell’s as Helen (Pamela)’s father. It’s a tragic character, instilled with conflict over a genuine care for his wife and children, but weighed down with the alcoholism that quickly deteriorates his health. The supporting cast is solid, from Jason Schwartzman and B.J. Novak as songwriters Richard and Robert Sherman, respectively, to Paul Giamatti as the talkative driver, the chauffer of Travers during her visit. There’s a moment in the film where Walt Disney vocalizes the reasonable belief that Mary Poppins is a character to save the Banks children, and Mrs. Travers scoffs at the very idea. At the moment it occurs, we brush it off as a simple example of her snobbery. By the end of the movie, we understand what it means, and why she found the idea so juvenile. Saving Mr. Banks is filled with a lot of nice moments like that, thanks to its well crafted screenplay. Here is a wonderful movie that, despite its shortcomings, still provides a warm and great experience. lot of people are (including myself). Disney makes a movie about Walt Disney… or maybe that’s technically not true. The first trailer for Saving Mr. Banks was released today, July 11, and features Tom Hanks as Walt Disney, and Emma Thompson as P.L. Travers, the author of Mary Poppins. This movie will apparently follow the life of Travers, and her relationship with many aquantences, and this will include Mr. Disney. It looks entertaining. I admire the production design, at least based on the three minute clip. Slated for an Oscar season release, I could see myself reviewing this one, and will consider it as more information (but as few trailers as possible) becomes available.